What a great idea. And yes, the couple times I've made cheesecake, it has seemed like a production. I don't have a round crockpot anymore, mine will be oval. Thanks for the recipe. Trying this one very soon. Lea Ann, my slow cooker is oval as well. You can make this in any slow cooker as long as it's wide enough to handle the 7-inch springform pan. And if yours didn't come with a wire rack, you can just form a ring of aluminum foil to set the pan on up out of the water. 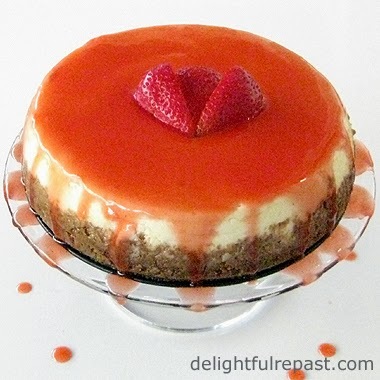 Mmmmmm, cheese cake is one of my all time favorites! This looks delicious and easy. Might have to try it using almond meal for the crust. Thanks, Richard! Yes, the almond meal makes a wonderful crust for cheesecake, especially when it has an apricot or cherry topping. Amy, wish I'd thought of it. There was a recipe in the booklet that came with my slow cooker, but it wasn't ideal AND it called for cooking with the pan sitting directly in the slow cooker. I might try that next time, but I have a feeling the steam does something wonderful to the texture. Judy, if you're baking a cheesecake in the oven, try putting a large pan (maybe 13x9x2) on the shelf below and filling it with a kettle of boiling water. That should generate enough moisture in the oven to give the same effect. PS Judy - Yes, strange as it sounds, I know people who hate cheesecake! I am intrigued, Jean. Now I just have to find a proper baking form because my slow cooker is not round, but oval-shaped. Angie, as long as your oval slow cooker is wide enough for the 7-inch round springform pan, you're all set. My slow cooker is oval, too; it's a more practical shape for me than the round. Wow - would certainly never have considered recipes where another pan/container goes in the slow cooker. (I was wondering how you got it out, looking so good!) Most intriguing. It's soooo easy, Pauline. And the texture is exceptional. My husband says it's the best cheesecake he's ever had. He wants me to make another one tomorrow. I told him he could make it himself, it's that easy! I know what you mean, Greg - I mean, I can understand that someone might not like liver, but cheesecake? Everyone in my house loves cheesecake. In fact, several times my daughters have requested cheesecake in lieu of a traditional birthday cake. That's okay with me! Where did that delightful picture of the strawberry cheesecake go? Oh, dear. I licked it off the screen. No matter. It wasn’t big enough. Is there a recipe for a bucket of cheesecake? 5 cleavers! 5 cleavers, I say! Cheryl, thanks! Hope you get that pan soon. If you don't find one at your favorite shops, look at the one I linked to on Amazon and all the other ones they have. I actually have two of that size. Very handy. Oh, Sully, it's always such a thrill for me when I get your 5-cleaver rating! And I consider cheesecake practically "health food!" if ever there was a reason to get myself a slow cooker, surely this is it!... i'm so intrigued and it looks gorgeous. Dom, thank you so much! I'm new to slow cookery myself but am glad I have one now even if all I ever make in it is cheesecake! What a great way to make cheesecake. Thanks, yummychunklet! Hope you'll try it soon! But...my new toy...a $45 grill from Walmart. It's wonderful. Since I don't have a/c in the kitchen I'm grilling outside and no pots and pans to wash up. I love it. Tonight was pork chops with grilled squash and zucchini. Tomorrow night it's meatballs with green peppers, onions, and pineapples. Pat, that sounds very sensible - anything to manage in the heat! You seem to be managing beautifully! Thanks, Pam! And the texture is simply the best ever! Thanks, Christine! If your pan won't fit in your crockpot, just order a pan that will! So, two comments, not about the recipe itself but the copyediting. 1: There no instruction to actually add the filling to the prepared crust. We jump directly from mixing the filling to putting the cheesecake in the crock pot. 2: The bit with the asterisk and the parchment paper. Yes, one should always read through the whole recipe before one begins. But this text should really be up with the buttering the pan instruction, not after the crust instruction where it's too late. Erik, thanks for the comment. I so appreciate it. Though I'm leaving number 2 as is (might be a bit awkward, but the asterisk should be fine because cooks should read through a recipe completely before they start making it), I've made the change suggested in number 1. Can't believe I left out "Pour cheesecake filling into prepared pan." Good catch!